The Olive Branch Baptist church was organized in the year 1846, by the efforts of a Baptist minister, Elder B. D. C. Herring. The organization meeting was held at the home of Elder Herring then located some distance south and west of the Hoosier vicinity. The organization was completed with seven charter members who evidently had been members of the Samaria church, or of distant churches. The church covenant and articles of faith which were adopted prove their soundness in the word of God and their simple faith in Him. "Record of the proceedings of a meeting, held by Baptist brethren and sisters according to previous appointment, May 30th and 31st in the year of our Lord one thousand eight hundred and forty-six in Stogden (Stockton) township, Greene County. Set for the purpose of constituting a regular Baptist Church of Jesus Christ. Elder B. D. C. Herring, the minister who attended and delivered an appropriate sermon from the Acts of the Apostles, 2nd chapter and 47th verse, after which Brother Isaac Mitchell was chosen moderator. After proper deliberation and with due regards towards our brethren by reason of a long established custom with our brethren of calling a council of brethren from a number of different churches, there being none present but those who expect to go in the constitution, it was agreed that we adjourn until the Sabbath morning at 10 o'clock. First: Calling for the letters where the following brethren and sisters handed in letters of dismission and recommendation which were read and accepted and the names enrolled as follows: Elder B. D. C. Herring; Isaac Mitchell; Matilda Pope; Jane West; Fieldin Herring; William Mitchell; Elizabeth Mitchell; Rachel Mitchell. Second: We unanimously agree to be constituted into a Gospel church or in other words having in view the glory of God and the advancement of the Redeemer's kingdom, as well as the mutual comfort of each Gospel church on the principles of the New Testament." During the year of 1846, the church acquired property, by a gift from David Bledsoe, at the present site of the Salem church. Olive Branch still holds title to a plot of land adjoining the Salem property on the east. Meetings were held regularly, once each month in a log building which had previously been erected. By the close of the year the total church membership had increased to nineteen. Of this increase eleven were admitted by letter or relation of Christian experience and one by baptism. There were seventeen additions during the year of 1847, mainly by baptism. During the years that followed, the membership increased steadily and the work continued under the pastorate of Elder B. D. C. Herring. The meeting place was, in the meantime, moved to the approximate location of the present Lebanon church. This was known as the "Old Log Meeting House." It is not known why the church was moved to that location, or just how the property was acquired. 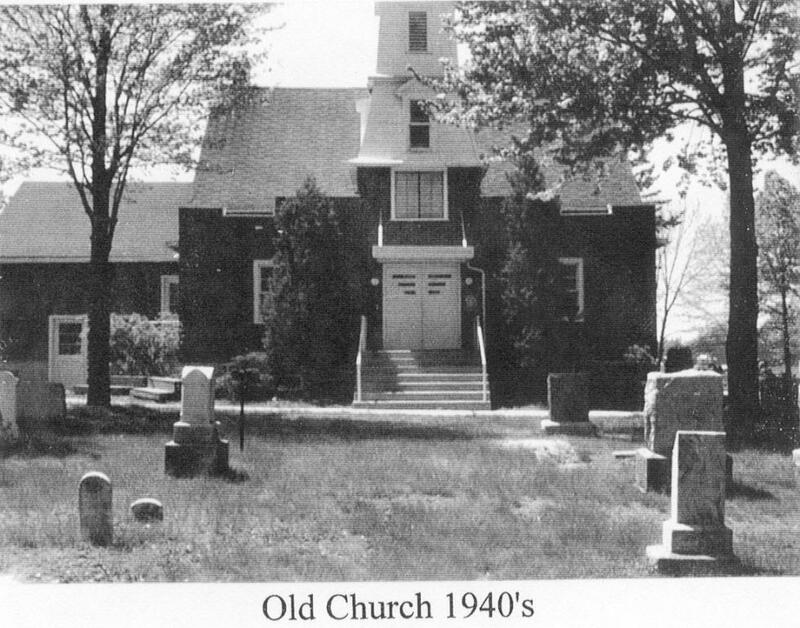 Until recent years the Olive Branch church held title to a plot of land that is now a part of the Lebanon cemetery. In 1856 Elder Herring organized the Lebanon Baptist church and moved his membership there. He closed his work at Olive Branch and was succeeded by Elders Trent, Cole, and McBride who carried on the work for the following four years. There is no record available as to the meeting place of the church during those four years. There are no records for the Civil War Period, 1860 - 1866. It seems evident that regular services were discontinued during that time. The early church held strict discipline over its membership. Exclusions were common for such violations of conduct as swearing, dancing, adultery, fornication, drunkenness, card playing, unbecoming games, Sabbath breaking, and non-attendance of church services. It may be added that the members excluded usually appeared before the church in a short while, to make confessions of their misconduct and ask to be reinstated. Regular quarter time service was resumed, probably at the Burge school house in April of 1866. In September of that year Elder James Plew was called as pastor. 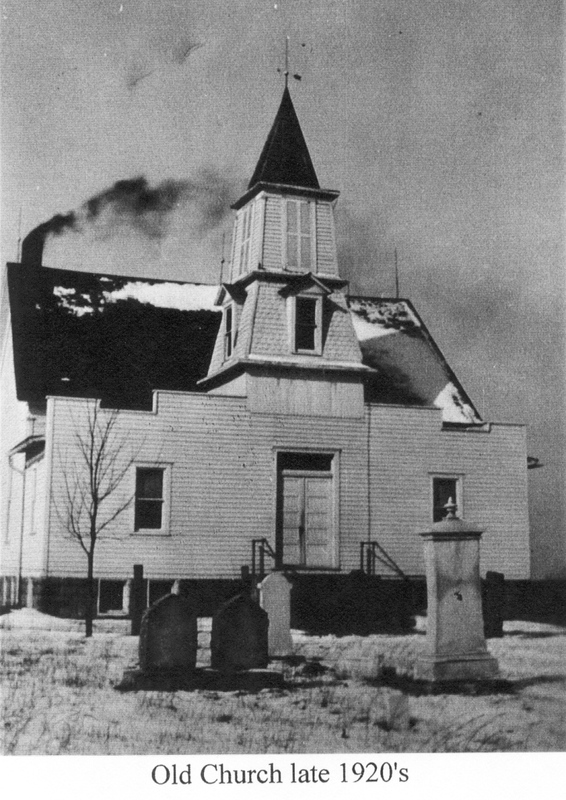 One of the greatest events in the history of the church was the revival held at the Burge school house, beginning in December and continuing to February 19, 1867. This was known as the "Sixty-Five Day Revival." In this meeting, under the preaching of Elder Plew, the membership was greatly revived and there were forty additions to the church by baptism and ten by letter. It seems that the total membership was then about sixty-five. Elder Plew continued as pastor of the church for four years with a salary of $150.00 per year. During the year of 1867, the present site of the Olive Branch church was selected, and a frame building was erected. The place selected was known as "The Crossroads" as a number of roads converged there. The land was donated by Alexander Beasley, one of the members. Later additional land was granted the church by Ransom Beasley and other heirs to the land. The land of that grant lay between the original church property and State Road 54. The Olive Branch cemetery was started in 1868 when an infant of John Fullum was buried there. John Fullum himself, was probably the first member to be buried there. The Olive Branch cemetery has always rendered a free burying ground, and many of the early members are buried there. In 1897, under the pastorate of Rev. I. J. Brewer, a new building was erected. The old building was sold to Dave Lynn for the sum of thirty dollars and was moved to the Richard Page home, where it stood for many years. The church considered the matter of erecting a brick building, but a frame structure was finally decided upon. It has been reliably stated that, at a meeting where matters concerning the new building were being considered, that a rather heated argument arose, which threatened to disrupt the unity of the church. Seeing the danger, Rev. Brewer asked that all those present kneel in prayer. After this was done the meeting proceeded in complete harmony. 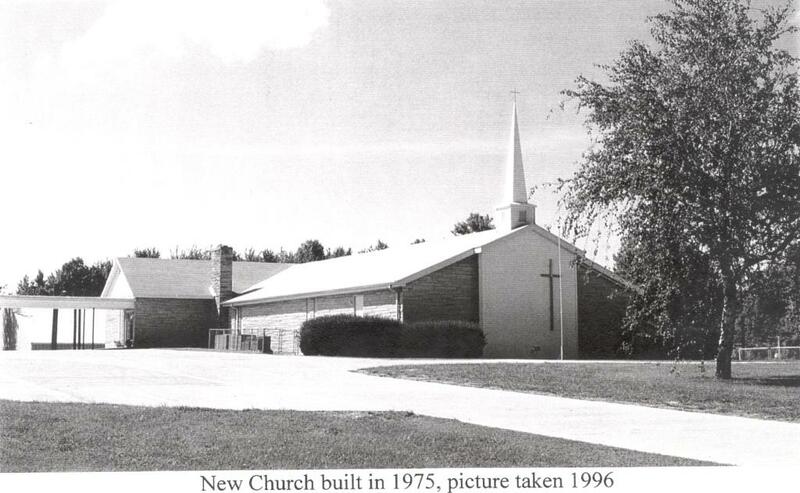 The new church building was erected with an approximate cost of $875. Funds were collected by a committee composed of Henry Bolten, C. L. Squires, and Reuben Lynn. Mary J. Lynn collected money amounting to $45 to purchase the beautifully toned bell, of which the community was proud. A later addition was made to the church building in 1910, and more in 1922 when two Sunday School rooms and a basement were added. In June 1, 1913, the church passed from quarter time to half time services under the pastorate of Rev. I. J. Slater. It became a full time church June 1, 1930 under the leadership of Rev. W. I. Barkley. The current church building was built in 1966 with a seating capacity of approximately four hundred. The building was completely paid for by 1975. The children's church began meeting in 1971. We were having a great influx of children after we began the church bus routes. We have Nursery, Beginners, Primary, and Junior classes. These classes are up through the sixth grade. In each group they learn Bible verses, songs, and have Bible stories. In more recent years there have been many improvements around Olive Branch, some small and some quite large. In October 1988 the ceiling space behind the baptistery was enclosed into an attic. Most of the work was done by Bob Steele. This served to make room for choir music and other storage. In 1989 it was decided to put new tile flooring on the main basement floor. Until this time the floor had only been sealed and painted. Through the efforts of Chuck Coyle, Ferris Pope, and Bob Steele, an all-purpose 40' x 100' building with additional classroom space and a gymnasium was erected behind the church for our teen and AWANA activities. On September 12, 1990 a motion was made for the "all-purpose building" to be named "The Tim Ryser Memorial Building" and the building was dedicated on October 7, 1990. Tim Ryser passed away during his freshman year of high school and was very dedicated in working with young people and children's church. Tim was the son of former pastor Eric Ryser. During 1991 an International 66 passenger bus was purchased from Sam Lucas and sanded down and painted in our usual white with green trim. Also that year the men along with Morrison Brothers repaired and rebuilt the deck on the south side of the parsonage. An entrance with a ramp was also made on the south side of the parsonage. The Branch, which is a monthly newsletter put out by Pastor Young and Millicent was started in 1991 as an outreach for shut-ins in our community. The organ needed to be replaced in 1992, so shopping started in March. By April a new $15,000 Baldwin organ was purchased on sale for $9,000. Also that year a new water fountain was secured for the Ryser Building, and the nursery and cradle roll got new "country blue" carpeting. In July 1995 the terrible holes were fixed at the highway entrances and concrete paving was begun on the driveway and parking areas. In September of 1995, the old 1968 auditorium carpeting was replaced with new gray carpet. This included the main auditorium, choir loft, platform, over-flow classrooms, and cloak room. Over the years, Dave Love has up-graded the P.A. system, basement Sunday School rooms have been carpeted, and outside air- conditioners have been fenced in. A new roof was put on the main building with additional insulation added to the attic. The eaves were boxed in for better looks and economy. The most recent projects just finished in 1996 were the replacements of the basement door, concrete drives, and parking areas around the entire building. The Olive Branch Hour aired on WBTO/WQTY at 8:30 every Sunday morning. This program was an outreach of our church from October of 1954 until 2006. It originally aired at 2 p.m. on Sunday afternoons. The only one or two Sundays we missed were when the station tower was hit by lightening. Our church has now reached its 169th birthday. We have faced common perils and problems; together we have rejoiced in the manifold mercies of God; together we have rejoiced as newborn souls entered into God's kingdom; together we now join hands and hearts to gaze beyond this earthly kingdom into the heavenly here-after where we shall be dwelling together with those who have gone on before in unbroken fellowship as the ages of eternity roll. As we travel onward, let us array ourselves in the whole armor of God. Let us lay aside every weight and the sin that hinders out progress. Let us ever be looking to Jesus, the author and finisher of our faith, who for the joy set before Him endured the cross, despising the shame, and is now set down at the right hand of God. Let us consider Him lest we be wearied and faint in our minds. The Olive Branch church has progressed through the years, by the efforts of its faithful members and pastors. The sound principles of doctrine and a heritage handed down from the past should be a great inspiration in keeping the Olive Branch Baptist church one of the out-standing rural churches of this section of the state.